landscape bursting with colorful, unique bizarre-shaped rock formations. They come in many guises, including soaring fins and towering spires (nicknamed "hoodoos"). They proudly stand erect in huge natural depressions called amphitheaters. May to mid-June and September to mid-October are ideal times to visit. The rest of the summer period can be overly packed with tourists. During the peak season, parking spaces at the lookouts become scarce. Do your sightseeing early or late in the day, or use the shuttle bus. Being at a viewpoint early in the morning or late in the afternoon has another advantage. The low-angled sun rays enrich the colors of the rocks. 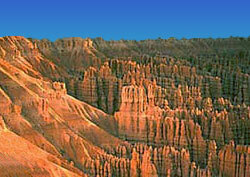 Bryce Canyon is long and narrow, with a north-south orientation. The 30-kilometer (18-mile) main park road runs along its western rim. There are over a dozen lookouts. The best are in the north (Sunrise, Sunset, Inspiration and Bryce).